The name is derived from Sanskrit, where its primary meaning is "of various fragrances and yellow orpiment". The name Chitragandha is derived from Sanskrit - a combination of Chitra (having different varieties) and Gandha (smell) to form Chitragandha. Together, they indicate of various fragrances. 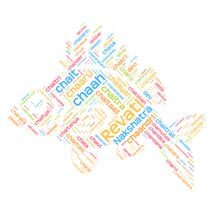 Chitragandha (चित्रगन्ध) finds to be mentioned in Lexicographers, esp. such as Amarasimha, Halayudha, Hemacandra where Chitragandha is used for " of various fragrances ", yellow orpiment. The name Chitragandha is not popular in USA as indicated by the absence of the chart. Chitragandha is an unusual name in India. Chitragandha is adopted by only some person in India as the name of their kids. As far as we can tell, Chitragandha is rare name. Chitragandha is also a nice name and it has a nice meaning attached to it. It has mythological significance also. Chitragandha is hard to pronounce for non Indians as it is with 4 syllables, might be that is why Chitragandha is not popular in the USA. Gunaji (Sanskrit: गुणाजी) is a Hindu Indian popular masculin..
Saran (Sanskrit सरण) is an ancient word of Sanskrit origin w..
Sanskrit word Muni (Sanskrit मुनि) means a sage, saint or ho..
Chandraprakash is the ancient Sanskrit boy name which litera..
Sayuj (Sanskrit: सयुज) is a Hindu/Sanskrit Indian popular ma..